Add Long John Silver's to your favourites! Long John Silver's Singapore serves its signature batter-dipped fish, chicken and shrimp in various platter combinations. Enjoy a quick and yummy seafood meal at affordable prices! There are 19 Long John Silver's Singapore outlets located islandwide. Visit and outlet for breakfast, lunch, or dinner. Visit the website to check out the Long Joh Silver's menu of combos, and also follow them on Facebook to get the latest updates on promotions and special sets. Long John Silver's prepares fresh batter throughout the day to ensure the best taste. The first Long John Silver’s restaurant in Singapore was opened in 1983. 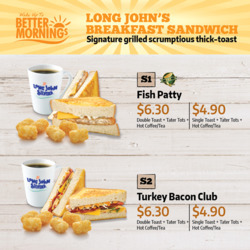 Do you want to receive more offers from Long John Silver's by email?